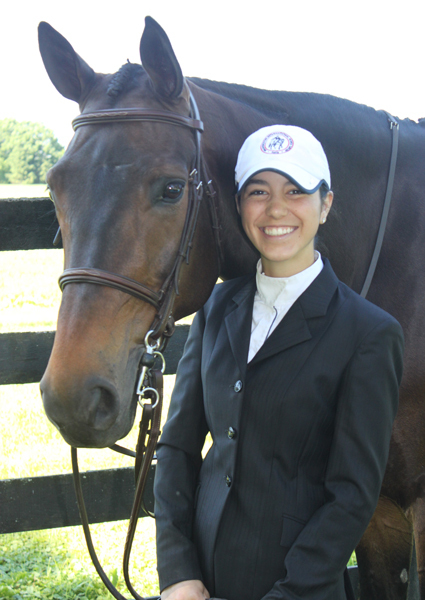 WASHINGTON, June 12, 2014--The Washington International Horse Show (WIHS), one of the world’s most prestigious equestrian events, is pleased to announce Mary Elizabeth Cordia of Alexandria, Va., as Youth Ambassador of the 2014 show. Cordia, 16, attends St. Stephen’s and St. Agnes School in Alexandria. Washington International Horse Show with her Warmblood gelding, Welcome, at the Upperville Colt & Horse Show, 2014. In her role as youth ambassador, Cordia will be the youth spokesperson for the show and chair the WIHS junior committee, a group of students from local area schools, who together initiate and work on youth programs and community-focused educational events, such as Barn Night and Kids’ Day. Both the youth ambassador program and junior committee began in 2009. Members are invited to join through an application process that begins in March. Learn more about the WIHS junior committee. Cordia, an avid equestrian, started riding and showing on a small pony and now competes in equitation and children’s jumper events. She is trained by Jenny Graham of Cedar Creek Farm in Sterling, Va.
After attending the Washington International for many years as a spectator, in 2011 she rode at Verizon Center the first time and the following year she won the WIHS Regional Hunter Championship. That same year she received the inaugural Laura Pickett Trophy for Excellence in Horsemanship, given by WIHS in memory of Laura Pickett, a dedicated and well-loved local trainer, and presented to an up-and-coming rider and their trainer for enthusiasm, dedication, style and commitment to excellence in horsemanship. When not riding, Cordia is an active volunteer. As student ambassador at St. Stephen’s and St. Agnes School, she represents the school by giving tours to prospective students. She is also an official year book photographer, her other passion besides horses. (Several years ago, she started a horse show photography business, Clip Clop Click Photography.) She currently co-chairs the Virginia Horse Show Association junior committee. The 2014 WIHS junior committee is made up of 20 students from public, charter and private schools in Maryland, Virginia and Washington, D.C.
2014 WIHS Junior Committee: Chair: Mary Elizabeth Cordia, youth ambassador. Members: Lily Barber, Terry Daniels, Miriam Dupree, Kiki Konopnicki, Elizabeth Kruse, Olivia McCarren, Caroline McGranahan, Rachel Michael, Alexis Mozeleski, Hanna Powers, Natalie Ralston, Gaby Ruff, Emily Schlosberg, Casey Schmitz, Jenny Searles, Chace Simmons, Mollie Thomas, Natalie Wachowiak and Jenna Zimmerman. The 56th annual Washington International Horse Show will be held October 21-26, 2014 at Verizon Center in Washington, D.C. Chair: Mary Elizabeth Cordia, chair, 16, youth ambassador, 2014. Attends St. Stephens & St. Agnes School. Started riding on her 7th birthday. Recipient of the Laura Pickett Trophy for Excellence in Horsemanship at WIHS in 2012. Lily Barber, 16, attends Langley High School. Member since 2014. Terry Daniels, 17, attends KIPP DC: College Prep. Started riding four years ago and also loves trying new foods. Member since 2011. Miriam Dupree, 16, attends The Potomac School. Started riding at 3 years old. Loves hiking and traveling. Member since 2013. Kiki Konopnicki, 16, attends St. Stephen’s & St. Agnes School. Enjoys photography and basketball. Member since 2014. Elizabeth Kruse, 17, attends Langley High School. Competed at WIHS for the first time in 2012. Youth Ambassador, 2013. Member since 2012. Olivia McCarren, 13, attends Westland Middle School. Started riding when she was 7. Member since 2012. Caroline McGranahan, 16, attends Langley High School. She started riding about age 10 and is a huge Washington Nationals fan. Member since 2013. Rachel Michael, 15, attends The Madeira School. Started riding when she was 6. Member since 2011. Alexis Mozeleski, 17, attends Washington International School. Riding since age 7. Loves writing. Member since 2012. Hanna Powers, 17, attends The Madeira School. Youth Ambassador, 2012. Member since 2012. Natalie Ralston, 15, attends Langley High School. Riding since age 7. Plays the flute. Member since 2013. Gaby Ruff, 17, attends Thomas Edison High School. Started riding at age 12. Loves macaroons. Member since 2011. Emily Schlosberg, 16, attends Robinson Secondary School. Enjoys traveling. Member since 2012. Casey Schmitz, 16, attends Stone Bridge High School. Began riding at age 5. Likes to go fishing and anything chocolate! Member since 2013. Jenny Searles, 15, homeschooled. Started riding at age 7. Represented Maryland in the 4-H Eastern National Horse Bowl competition last year in Louisville, Ky. Member since 2013. Chace Simmons, 16, attends Colonial Forge High School. Started riding at 5 and now competes in show jumping. She rides with Brooke Kemper. Likes art and architectural design. Member since 2013. Mollie Thomas, 16, attends The Madeira School. Started riding at age 5. Enjoys swimming. Member since 2014. Natalie Wachowiak, 16, attends South River High School. Began riding at age 6. Competes at local shows. Loves to make videos. Member since 2012. Jenna Zimmerman, 13, attends Kilmer Middle School. Enjoys dancing and listening to music. Member since 2014. An equestrian tradition since 1958, the Washington International Horse Show is the country's premier metropolitan indoor horse show. Each October, hundreds of world-class horses and riders, including Olympic medalists, arrive in Washington for six days of exciting show jumping and hunter competition. Highlights include the $125,000 President's Cup Grand Prix (a World Cup qualifier), the Puissance (high jump) and WIHS Equitation Finals featuring the country's top junior riders. Exciting equestrian exhibitions, boutique shopping and community activities, such as Kids' Day and Breakfast with the Mounted Police, round out this family-friendly event. WIHS is an official USEF Heritage Competition and recognized as a Top 25 Horse Show by the North American Riders Group. Since its debut, WIHS has been a Washington, D.C. institution attended by celebrities, business, military and diplomatic leaders, as well as countless horse enthusiasts of all ages. Washington International Horse Show Association, Ltd. is a 501(c)(3) nonprofit charitable organization headquartered in Washington, D.C.